In Key Stage 1, we offer a broad and well-balanced curriculum and each day, challenges and new areas of learning are presented to our eager pupils. The curriculum followed at Weston Green covers National Curriculum subjects and more, and there are many cross-curricular links between subject areas. The keystones of reading, writing, mathematics and science unlock a huge and marvellous fast changing world for pupils to explore. These core subject areas provide children with the necessary skills for all further learning and as such they have high priority on each class timetable, preparing pupils for Key Stage 2. Our Year 1 class have recently been learning about the British Isles and enjoyed putting together their own reports about flooding in England. Working in pairs, the children listened to some news articles and watched news clips to gather ideas and tips on how to be a news reader. 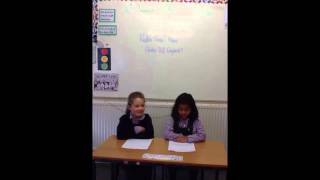 Watch a short video of Year 1 reading the Weston Green News, on the left hand side of this page.